I started working with six, seven and eight year olds this week. Two more weeks to go. To start things out, the summer program I'm working with requires me to create and ask my new students a few questions which I'll also revisit at our last class. One is "How can you make rhythm with your feet?" The other, "How can you make a pattern?" The predictable and unsurprising answer to that one? And that's it. That's all they got. My dream is to move kids beyond one-attribute linear patterns. You know, "red blue red blue" or "circle square circle square." I think those are fair places to start, but based on my experience last summer, even when kids get into upper elementary, they still give the same two answers as the 6 year olds. It's a wasteland out there. 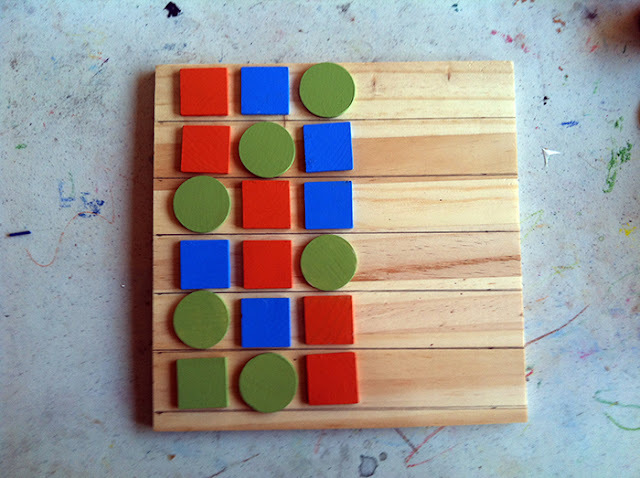 We're literally wasting kids' time on AB patterns when we could be engaging them in some truly exciting, interesting and beautiful mathematical pattern-based play, analysis and reasoning. "How many different kinds of patterns can we make?" "Recipe" (algorithm) patterns (and there I've noted the beginning 'recipe' for our Pizza Clogging choreography which we'll extend next week with our own favorite pizza toppings in our feet. I also read them the fabulous book How to Make an Apple Pie and See the World). Nature's numbers: The first nine numbers in the Fibonacci sequence including the one that showed up in the apple star I 'magically' discovered. 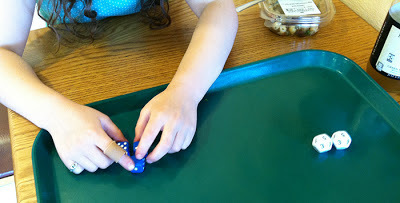 Of course we'll also look into linear patterns too, but before we design pattern units and make our beaded icicles we'll read The Lost Button (a Frog & Toad story) and investigate the attributes in our bead choices (color, texture, shape, size). Because, when you have more than one attribute you get to think deeply about similarities, sameness and differences, another thing I don't think little kids are asked to do often enough. 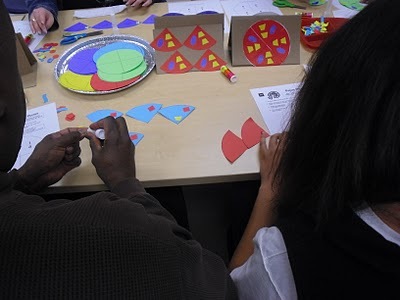 With more than one attribute you get a chance to evaluate, analyze, think, talk, make, dance, sing, tap and clap mathematics. I don't have a lot of time with these kids, but I hope that the world gets a little bigger and their eyes open just a little more to the beauty and structure around them. Because how will they come to know and love math otherwise? These are the basics, folks. Just like 'literacy' is way more than decoding written words, so too is math. A visual, kinesthetic, aural and expressive mathematical literacy for all elementary students. That's my dream. Every day this week we've been playing with math dice. Enthusiastically. Did I mention the enthusiasm? I had always thought my girl was not what I would call 'systematic' or 'precise'. I know for sure she is prone to intuitive leaps of connection or understanding and lots of messy tinkering, none of it looking either precise or systematic to my eyes. As I've been drafting and revising this post I've realized that maybe she has been those things, I just haven't been able to see it. And, as we've been playing the dice game I've watched her systematically running through different combinations of the six-sided dice (by moving the dice physically to different positions) and reasoning to herself out loud as she thinks through the different ways to use the hand she's rolled. I guess I always thought that precision in mathematical problem solving looked, well, neat and orderly and on paper. Anyhow, I am not (too) ashamed to admit that I was wrong. I think she's been precise and systematic in her own way for a while now. In retrospect, I realize I've heard this kind of 'talking herself through' a series of moves or ideas before. Systematically. In math and in many other contexts. For years. In a messy, verbal, highly enthusiastic way. Okay, so I'm a slow learner I guess, but pretty open minded all the same. I think it's worth considering that there must be a difference in the way children and adults go about their reasoning. Or, at the very least, that I have a deeply ingrained image of 'what it looks like to do math'. I'm going to keep thinking about all this. If you have any observations or resources to share on this subject, I'd be tickled pink. In the end, I'm super impressed that not only is she beating the pants off me but she has also created her own strategy for combining operations to reach a target number. And it's all her. The only thing I did was bring out the dice. Me: Hey, I totally get it, but you wanna hear an easier way to say it? Me: What's half of two? Me: What's half of one? Me: What's half of one half? Me: Ummm...you know how when we bake muffins? Her: So it gets smaller as it gets bigger! What's remarkable to me about this particular conceptualization is that one, it mirrors thinking of done thousands of years ago by philosophers -- but she has never heard those paradoxes. The second thing is that, obviously, she's not done much with fractions and yet, the idea of half-ness and size is fully there. And all this before 7:00am. Any time is math time, right? 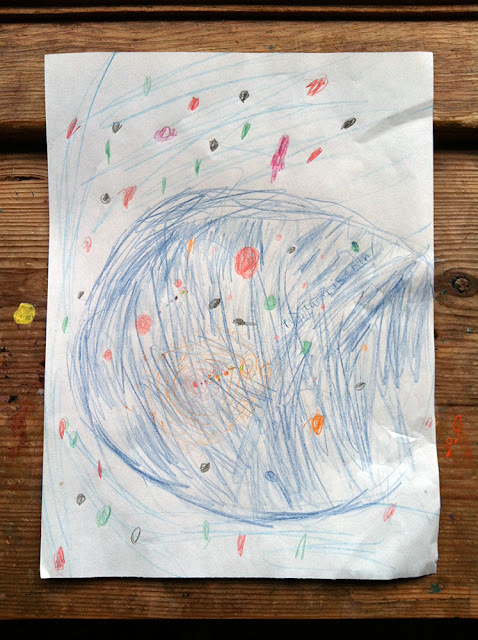 Something shifted in my newly eight-year-old in the last week. 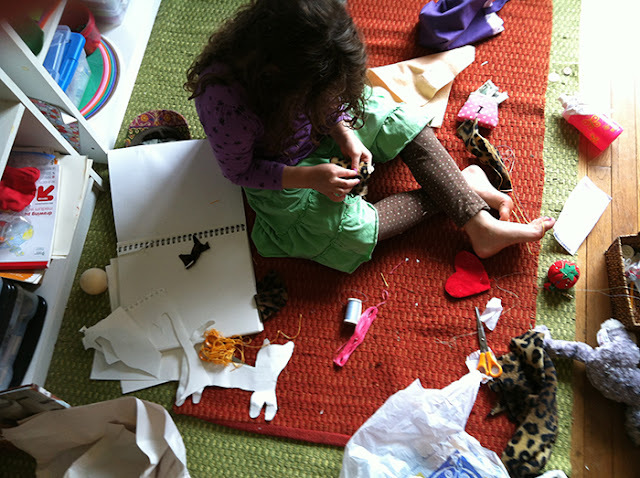 It shifted in terms of how she understands math and science and in how she sees herself. Here’s how I came up with this theory. I saw the globe and was wanting to go on vacation and then I thought they should have a map of the universe but then I thought it would be impossible. But then this theory came to me. Since the universe doesn't have an end it must be a sphere and that is why no one has ever reached the end of it. You know a tube of toothpaste with toothpaste in it? Well, it might be like the universe with all the planets in it and the universe might be shaped like a sphere and part of something bigger. Just like the tube of toothpaste is part of our bathroom which is part of our house which is part of our town which is part of our city which is part of our country which is part of our world which is part of outer space. So, those images get bigger and bigger just like the universe is in something bigger. She had been working on and off for a few days to fully understand her own ideas about the shape and boundaries of our universe. Unfortunately, a lot of the physics concepts offered in the FB comments were hard to conceptualize at the elementary level. We were at the library a day or two later and she wanted to do some research - she found a book about the universe we hadn't read before and we started to read it. It was at that point I had a thought: thinking about the structure of the universe is also thinking about infinity. We've done some reading and thinking about infinity in the past few years, on and off but, until now it's been sort of a fuzzy concept. Here is one of her musings from this winter titled "What infinity means to me" written by her little dolly. 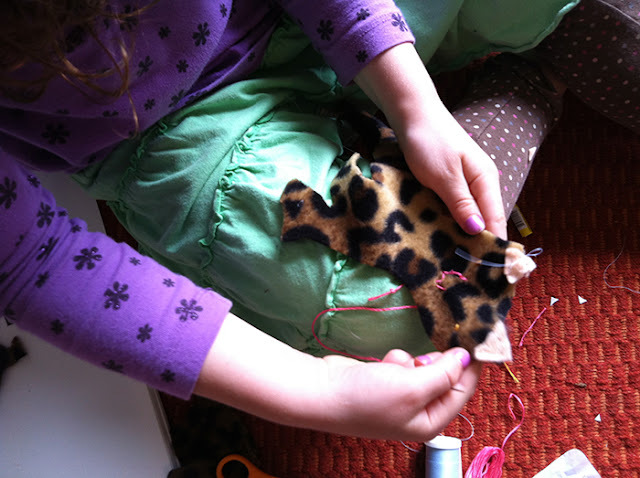 "It is sewing that has never been done. It is also cloth that can never be done. And a mountain that reaches on forever." After she watched it she said, "I want to solve one of those unsolved math problems! But I'll work on my theories [about the universe(s)] first." During all this Maria from Moebius Noodles asked Isobel if she would allow her thoughts to be published on the Moebius Noodles blog. My kid had to think about that for a little while. After all, these were her ideas in question. But, I reminded her about our conversations over the preceding few days that many good ideas stand on the shoulders of the work someone else has done. That's how good ideas are born -- from the seeds of past ideas and discoveries. "Not only that," I said, "but Maria is really interested in what kids think especially about math and science. She wants more kids to be able to share their interesting ideas." So, my kid consented, and even drew a picture of her idea. Her post is up now over at Moebius Noodles. Me: "Oh look, the Venus fly trap has caught some bugs!" Her: "I know. I've seen it multiple times." Her: "The picture of the [hexagonal] chip on the package is bigger than the chip in the bag." Her: "Oh, about two times bigger." I know this is a long post, but it's been a pretty remarkable week where my kid had an idea and the adults took it and ran with it. That's got to be super empowering if you're newly eight and realize your thoughts and ideas have weight within the larger world. I thank all those who participated in this pretty astounding adventure with us. She's not the only kid to have had these kinds of thoughts and ideas, but right now what I'm celebrating is just how great my friends were to have taken her ideas seriously which, in turn, showed her just how relevant she is to the larger picture of life. If you're a parent I think you'll understand just how grateful I am. p.s. If you want to comment just be aware they don't seem to always show up in this template, so try either a) adding a '?' at the end of the address and hitting return to reload, or b) just clicking out and trying again. Sorry for the hassle -- some weird Blogger bug I think. This post is in two parts: The first part outlines the basic flow and structure of a new game idea which, I think, has the potential to support the conceptualization of math concepts such as combinations, permutations, patterns, variables/attributes and reflection symmetry. I know that's a tall order so in the second part of this post I briefly discuss my reasoning, pose a few lingering questions and then ask for feedback. Make/build a rule. Find a way to change it. These are the game pieces. Set 1 includes two shapes, four colors. 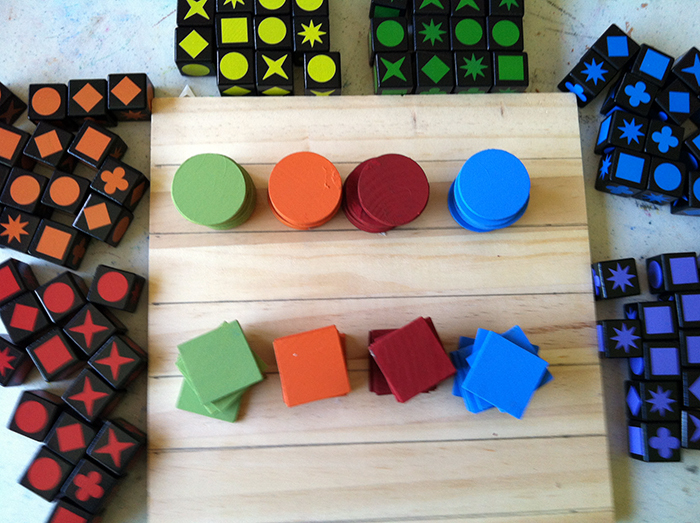 Set 2 includes six shapes and six colors. Rule Change #1: Make a rule/pattern. 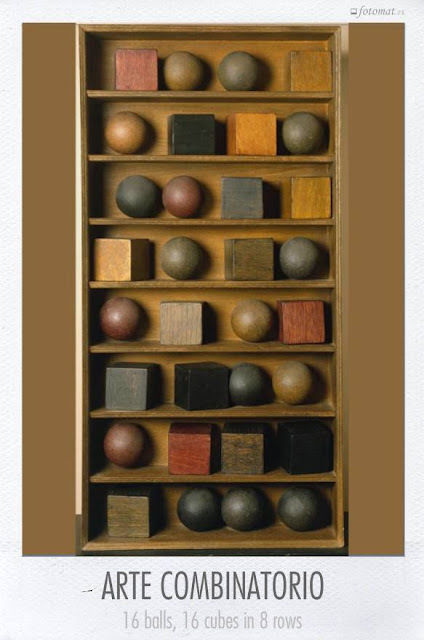 Using the same shapes/colors how can you make the next iteration different from the first. Does order matter? 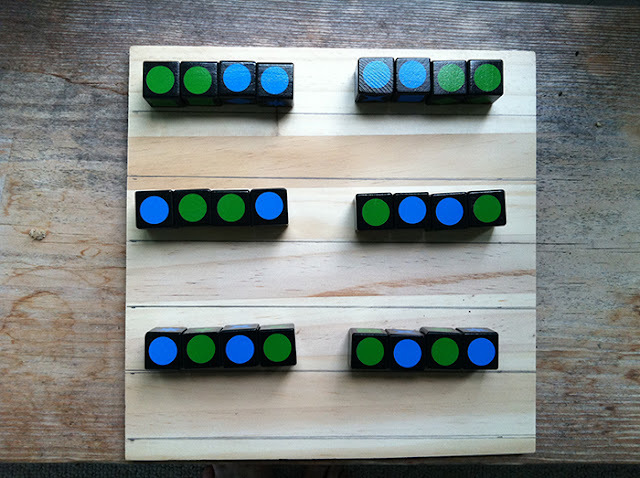 How many different combinations can you make? Rule Change #2: Make a rule/pattern. Change one element of each shape to make a new pattern. For example, orange turns into red, or square turns into circle. For each new design change only one variable for each piece. How many times can you change the rule? How many new rules/patterns can you make from your starter rule? Can you ever get back to the original rule/pattern? Rule Change #3: Build your pattern then reflect the design. 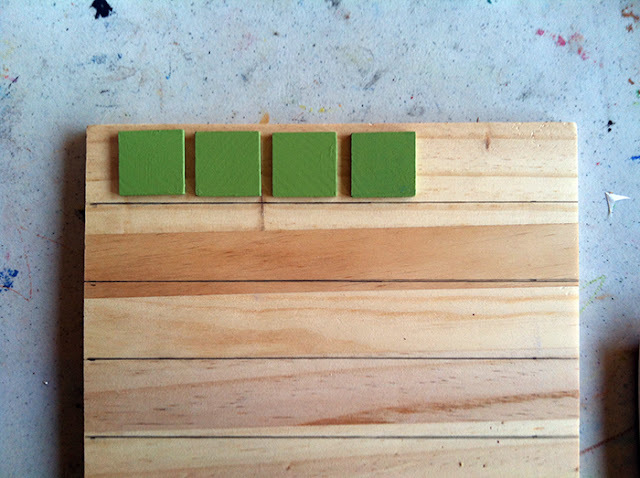 What do you have to do differently when you build the reflected pattern? But what happens if you only use one color and shape? 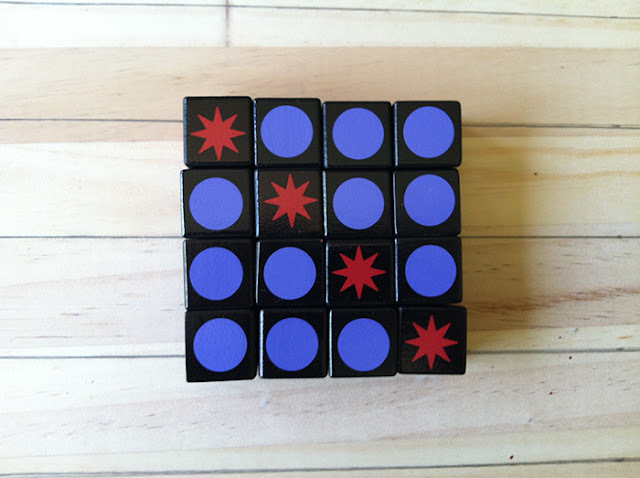 How many combinations can you make using three of one shape and one other shape? Would it change things if each of those circles were different colors? On another line of questioning, what larger design can you make by building your design line by line using the same shapes/colors in each line? Even though Part One seems like a lesson flow, it's really meant to be more of a general framework for exploration. My intent was to provide a little structure, some basic 'rules' and a lot of room for inquiry. I'm wondering if it really feels like a game, or is more of an activity? If it's going to feel more game-like, does it need more structure? A timer? Some 'change your rule' cards? Or, maybe, some cards that say how many different attributes to use in the pattern? How many different rules would be enough to create a sense of chance? What other 'change rules' would you include? Based on trying this out with my own kid this morning, if you were to do this more as an activity/lesson perhaps it would be helpful to have some really easy starter examples, like all one color, or two different colors to get the ball rolling in a positive direction. I asked my daughter to build a pattern with three pieces but then gave her the 'change rule'. She didn't really like that and we left it there. The game pieces and board are still out, though, hanging around. I'll see if she wanders back over. Another one of my goals for this game/activity was to also explore the ideas of attributes/variables in design -- how well do you think it does that? 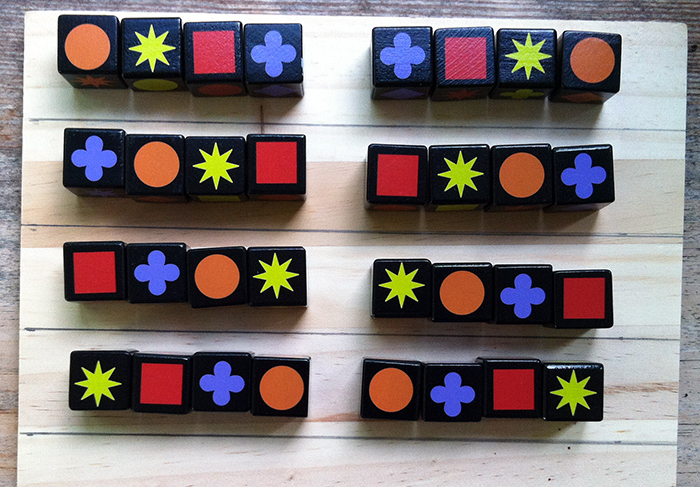 I intentionally did not use pattern blocks -- only one attribute/thing to change -- and instead made my own (Set 1). What would pull the attribute/variable idea out a little further? I hope it's clear that I am hoping to dig into the brain trust that is my modest but wonderful readership. That means you by the way, so please if you have any thoughts about all this, I'd love to hear your ideas. 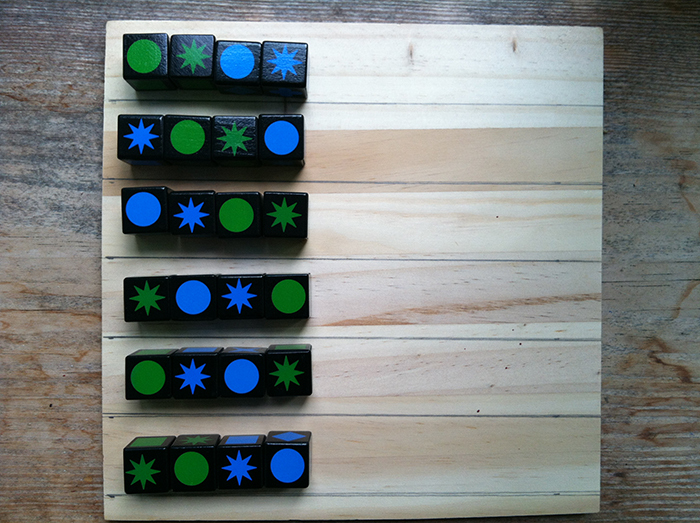 Things I would love feedback on: key ideas about combinations/permutations at the elementary level, thoughts about the game structure, ideas for other 'rule changers' to add into the mix, and any other thoughts you may have. Thank you!! p.s. If you want to leave a comment but don't see the comment section below, please consider refreshing this post or closing the post altogether and come back. This template has some bugs. If you don't see a green-lettered header and/or the page menu at the top, then chances are the template did not fully load. Sorry for the hassle. The kid told me she was making "a very shy cheetah of zero age." "Because she's not yet made...oh, and this kitty is named Island [pronounced Iz-land] and my next little kitty I'm going to call Infinity." You can change an environment in an instant! 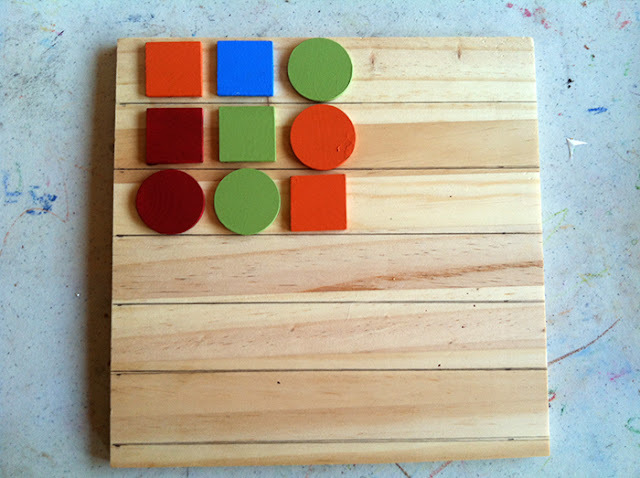 Need kids to be able to visualize diagonals while creating foot-based percussive patterns? Voila! 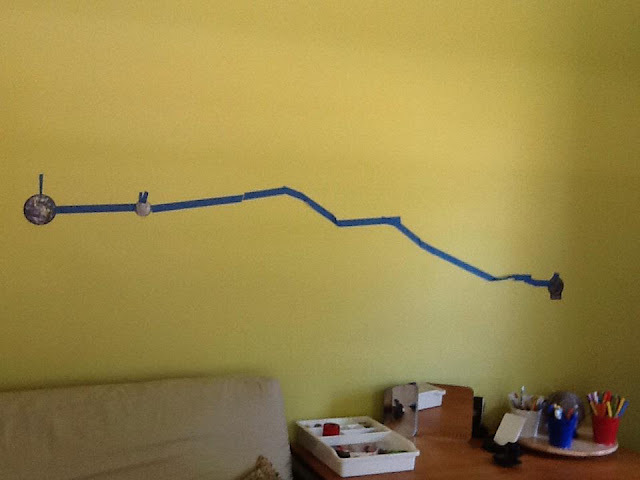 Are you six and want to visualize a trajectory to the moon? 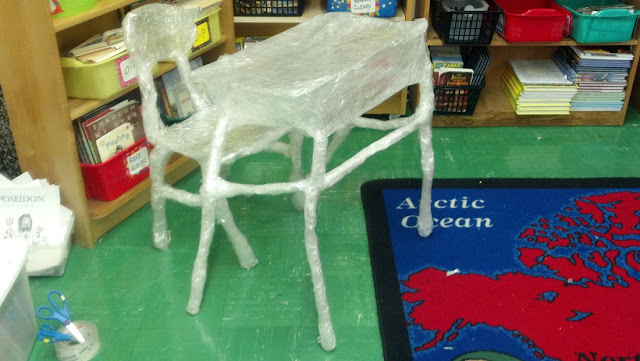 Tape's for you! Check out the endless ways tape can be employed in the interest of math, art, kinesthetic exploration, invention and education -- and then consider submitting some examples of your own! 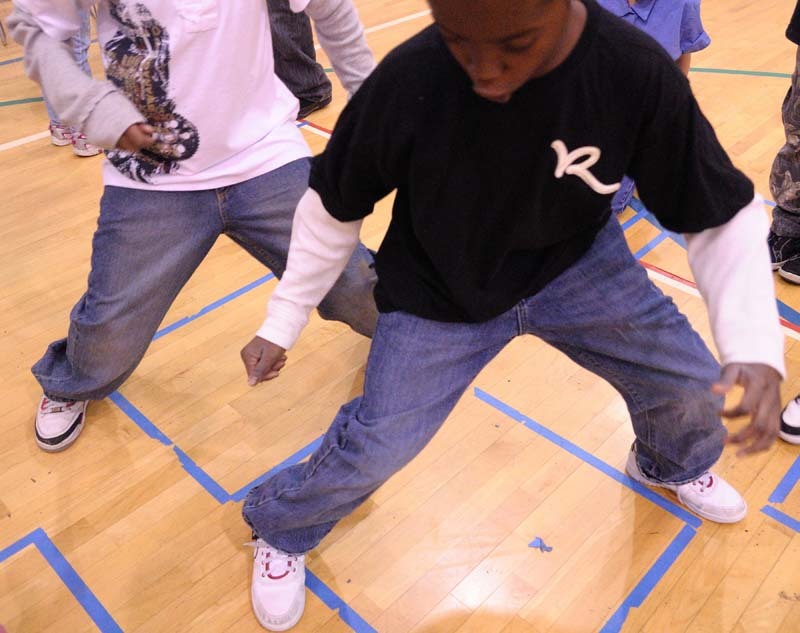 The Tape Chronicles are housed over at the Math in Your Feet website. Hope to hear from you!